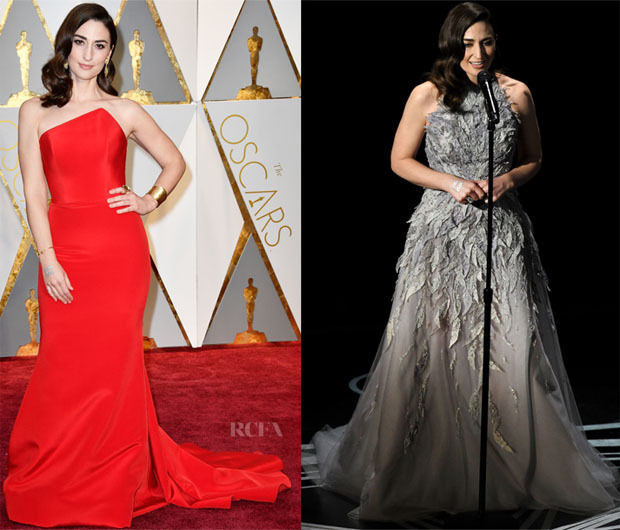 Sara Bareilles had a busy night of outfit changes at the 2017 Oscars on Sunday (February 26), with a total of three looks, more than anyone else I believe. 2017 Oscars Red Carpet: Red was a hot colour of the night, and Sara put it to work for her in this Romona Keveza Spring 2017 minimalist gown that was gilded with gold Marco Bicego Jewelry. 2017 Oscars Performance: For the In Memoriam tribute, she donned an Antonio Grimaldi Couture gown that was softly striking on stage with its muted gray hue complemented by feathery, dimensional embroidery and delicate tulle layers. She accessorized with Marco Bicego Jewelry. Vanity Fair Oscars Party: Her party-ready look had her exchanging the trains and longer layers of her first two looks for an easier-to-maneuver Maria Lucia Hohan black lace gown with Sarah Flint ‘Maggie’ sandals. Given that the sheer effect began from the mid-thigh down, the dress maintained an elegant panache with its flamenco rose finish at the neck.